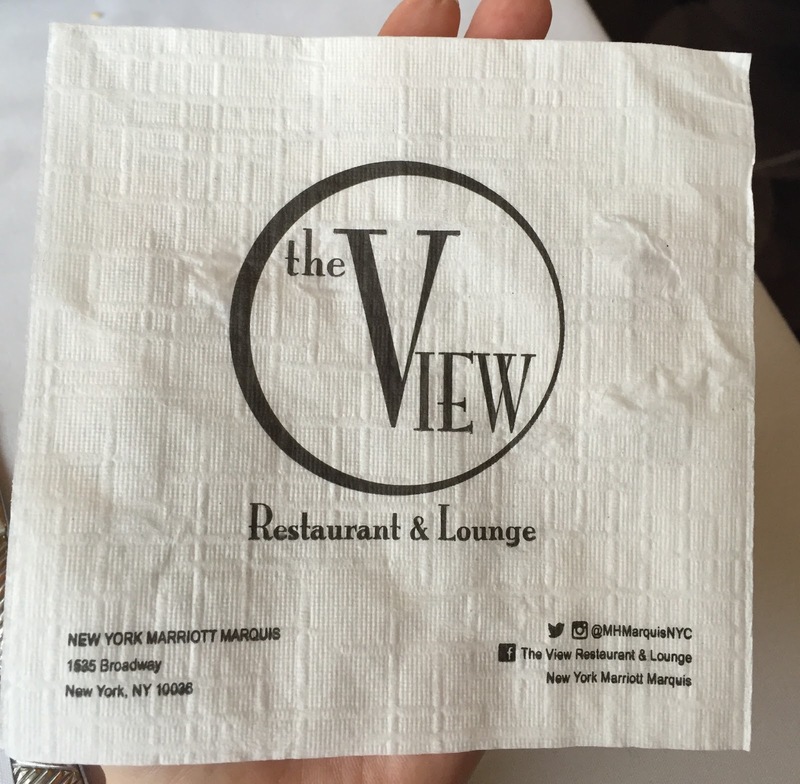 For my birthday, my husband took me to The View Restaurant. The View Restaurant is located on 47th floor, and the lounge is on the 48th floor, of Marriott Marquis in Times Square and it's the only revolving rooftop restaurant in New York. They serve Sunday brunch and dinner every day. We took 2 different elevators to go up to 48th floor, then was taking down to 47th floor by stairs. He booked a table early so that we could see the sunset, and t's still bright when we got there at 5:30 PM. It's prix fixe dinner course, and when we placed our order, a basket of breads was served with butter. There're 3 plain dinner rolls and 2 seeded rolls, which had funnel and white sesame. Seeded rolls had strong herbal scent. We wished the rolls had been warm. There're some little chewy oysters and many sweet corns. 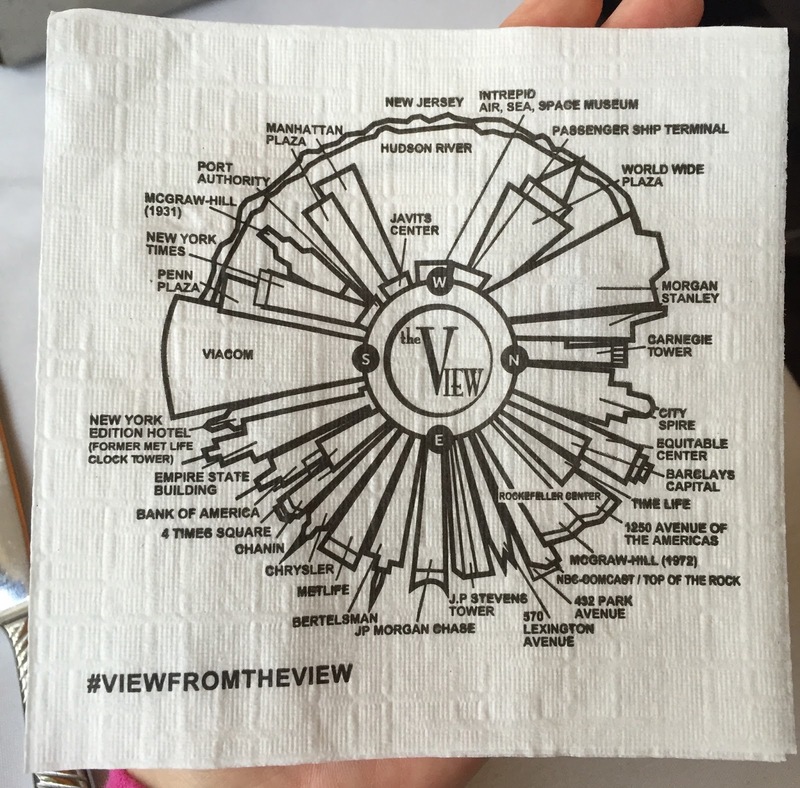 A server brought us napkins that show which buildings can be seen from the restaurant. 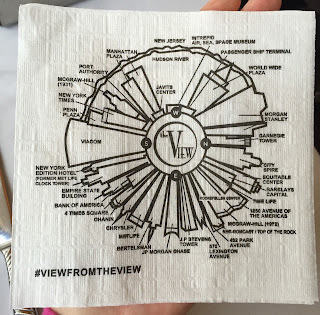 This view map looked like Millennium Falcon from Star Wars. 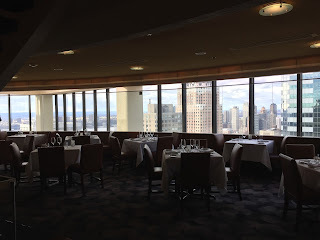 In the far sight, there's a pointy building and it's Chrysler Building, so we're facing South East. Chicken breast was moist, and between the skin and the meat, there're rosemary and butter. Leg confit was juicy and didn't have strong odor. The mushrooms on the left were in the shape of oyster mushrooms, but they had crunchy stipe like hen of wood (maitake mushroom) and chewy pileus. The ones on the right were regular mushrooms, and both of them were seasoned with garlic and sage. Pumpkin Risotto had vegetable sweetness, pumpkins were moist and I was really glad that it's not pumpkin spiced flavor. Towards the right, it's Hudson River. Facing to Hudson River and New Jersey. I always choose cheesecake, so it's easy for me to choose a dessert. Before the dessert was brought, a birthday cake with 2 candles was brought to the table and the servers sang a birthday song for me. "Happy Birthday" on the wavy chocolate. There're fresh raspberries blueberries and black berries, and the yellow sauce was passion fruits. Under the light and crispy chocolate, there's airy but rich in milk chocolate mousse, and this cake was one of the best chocolate cakes I've had. I'm not really sure where the lime was, but it might have been used in the cheesecake in place of lemon. Strawberry sauce was sweet and sour, and having cucumbers with dessert was quite unique. 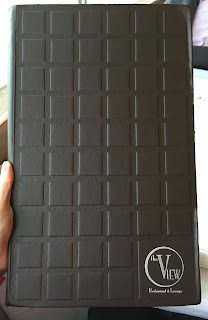 On the white chocolate, there're freeze-dried strawberries and shiny pieces. The cheesecake thick, creamy, and rich in cream cheese flavor, and it tasted similar to Junior's cheesecake. World Wide Plaza (triangle roof) and Morgan Stanley on the right. 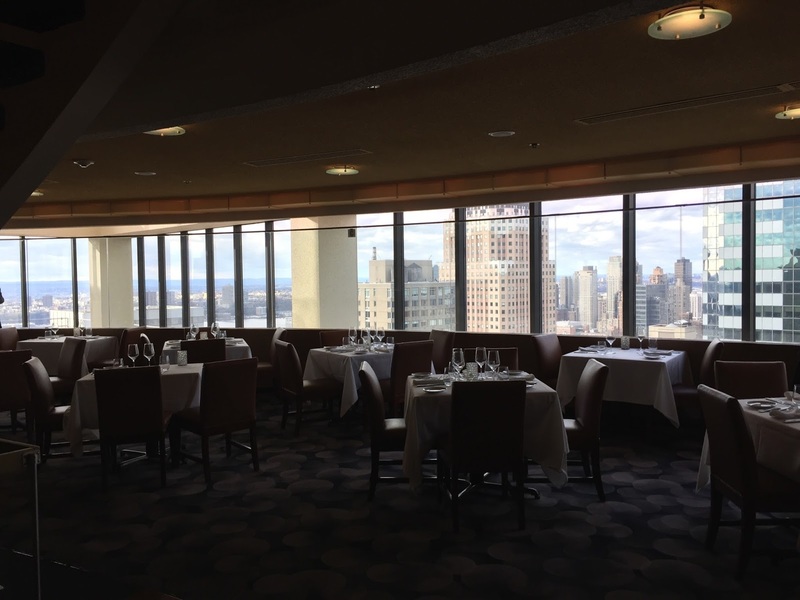 I took a time-lapse video to show what it looks like from the revolving restaurant. The time I started taking this video was around 6:40 PM and it's about an hour to complete the circulation.